Tattoo Blog » Quebec Wants Standards! Tattoo Blog » Dislike » Quebec Wants Standards! No doubt about it, the Canadian province of Quebec has heaps of talent when it comes to tattooists, as well as a thriving tattoo scene. Artists such as Yann Black have made an international name for themselves working out of Montreal, and this year’s Art Tattoo Montreal convention hit record high attendance numbers with over 10,000 people visiting the event throughout its three day duration. Yet despite the apparent love for tattoo and the talented artists who call the French-Canadian province home, the Quebec government is seriously lagging behind the rest of Canada when it comes to tattoo regulations. In short, there are none. After being forced to deal with this for too long, Quebec tattooists are taking a stand and making it known that the time is now for the Quebec government to begin putting measures into practice that will ensure a provincial tattoo standard. ‘”I think it’s unfortunate because people are left to do whatever they want, and not everyone knows what to do,” said Frank Lewis, who co-owns the Derm FX tattoo parlour in Montreal. Unfortunately, the provincial government of Quebec doesn’t seem to think that there’s any sort of problem with the way that things currently are. 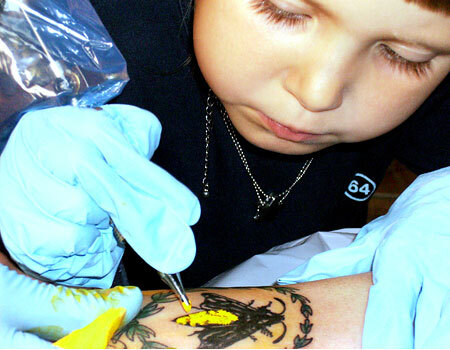 They feel that rather than set a standard and create an inspection unit that goes from tattoo studio to tattoo studio ensuring that said standards are being obeyed and that equipment is up to code, they prefer to use “educational campaigns” like posters, which tell tattooists to ensure that they properly sterilise their equipment. Man. This goes beyond ignorant. Here we have tattoo artists actually asking for standards and inspections in their industry and the government refuses to play its role. I always thought that it was the government’s job to ensure that its citizens were kept safe and healthy. Yet here’s a case of a government that plainly doesn’t care to even entertain such a thought. Not only that, but I’m sorry to say that artists sterilising their needles is only one potential problem. Any sane artist sterilises their needles, but what about the scumbags out there who don’t care about doing that kind of thing? They exist. There might not be tons of them, but they exist. By refusing to set standards and by refusing to take a peek into this rapidly growing industry, the Quebec government is taking the laziest, most irresponsible route that they can take. Listen to the people who work in the industry when they tell you they want changes that will improve things for everyone. Otherwise, things can only get worse. And that would be a real shame in a thriving tattoo environment like Quebec.